"The first time I worked with Wes was for a recording session at the Tsubo Club on San Francisco Bay. We played, just like we'd play in a club, with an audience, like crazy, with no other idea than to take off musically." Wes Montgomery was a late starter, not even beginning on guitar until 1942 when, at the age of nineteen, he first heard Charlie Christian on records. Six months later he was playing professionally, and by the end of the '40s--presumably because, as a self-taught musician, he didn't know such things were "impossible"--he had begun his astounding use of octaves and chords in his solos. Actually, Wes himself must take a fair share of the blame for the delay in his being "discovered." Until late in 1959, he had done virtually all of his playing (except for two years--1948-50--with Lionel Hampton) in and around his native Indianapolis, which is scarcely the hub of the jazz world. Riverside learned of him in September of 1959, through the excited reaction of Cannonball Adderley, who had listened to Wes far into the night when a one-nighter brought Adderley to that city. Once we heard him, there was no question as to what to do. 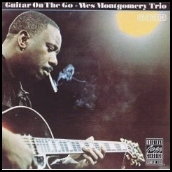 His first LP (The Wes Montgomery Trio) was recorded just a few weeks later. Shortly thereafter he began branching out a bit. He worked in California (where previously he had been known primarily only as a brother of Buddy and Monk Montgomery, the nucleus of the noted "Mastersounds"); and when he came to New York to record this album, there was one memorable night when he was persuaded to sit in with Horace Silver's group at the Village Gate and the audience almost literally tore the roof off the place. No doubt about it, while Wes Montgomery's success story may have been slow in starting, it is now happening and happening fast. Although the technically unbelievable feats Wes accomplishes on guitar may be the first things to catch one's attention, his true and substantial jazz merit lies basically in the fire and deep soul with which he performs them. The Incredible Jazz Guitar of Wes Montgomery, Riverside. A selected discography of Wes Montgomery albums. Far Wes, 1958-59, Pacific Jazz. Incredible Jazz Guitar, 1960, Riverside. So Much Guitar, 1961, Riverside. Portrait Of Wes, 1963, Riverside.